McDermott Convocation Center was built in 1989. 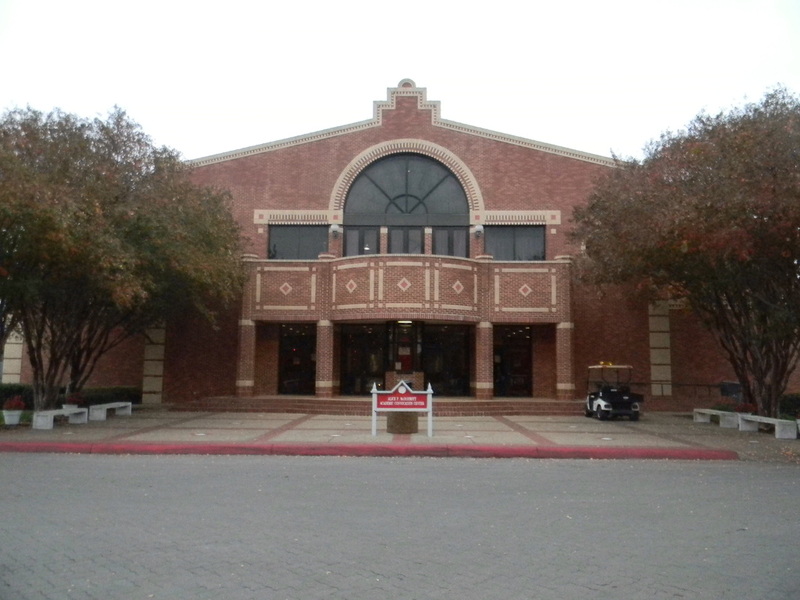 The arena sits 2,000 fans and is at the center of Incarnate Words athletic complex. The seating on the north side of the arena has five sections of seating with sections B, C and D having theater style seats. The padded portions of the seats are maroon and the bottoms are black. The band occupies section E. The seats excluding the theater style seating are grey plastic bench seats. On the opposite side of the arena we have more bench style seating with the first five rows colored maroon and the rest of the rows grey. The east side of the arena has brick walls in the center with windows from the Gorman-Mitchell Room near the top of the arena. On the other end of the arena they have the same brick design with the Incarnate Word crest at the top. The McDermott Center has two scoreboards one displays player numbers, fouls and points. The scoreboard on the opposite side displays the score, period and time. The exterior of the building is all brick. Light The Way at Incarnate Word. The "Blue Hole" On the campus of Incarnate Word. #1 Check out downtown San Antonio. The Riverwalk is a top attraction in Texas and the Pearl has several upscale dining options. #2 Parking shouldn't be too difficult to find with plenty of parking near the McDermott Center. Parking was free on my visit. #3 Take a walk around the campus. The "Blue Hole" and "Lourdes Grotto" are must sees. #4 Around the Convocation Center they have all the sports facilities. #5 Head to the McDermott Center! 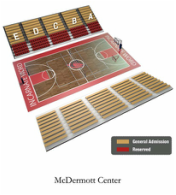 McDermott Center: The arena is pretty small but it was built in 1989 when the Cardinals were playing at a lower level. They will likely need to build a new facility to compete at the highest level. An arena around four to five thousand seems ideal for a school of their size. One thing missing from the arena, that is standard in most facilities, the Southland Conference team banners. Banners for their previous accomplishments were also missing. 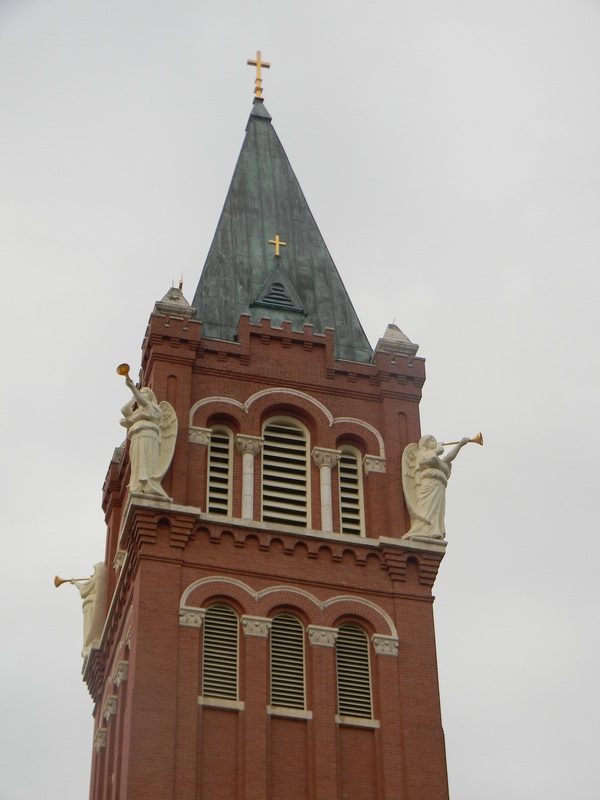 Incarnate Word Campus: The Sisters of Charity Incarnate Word founded the university in 1881. The 281 acres of land that Incarnate Word sits on were bought from George Washington Brackenridge. Today the Brackenridge Mansion still sits on campus. Near the Brackenridge Mansion you can find the "Blue Hole". 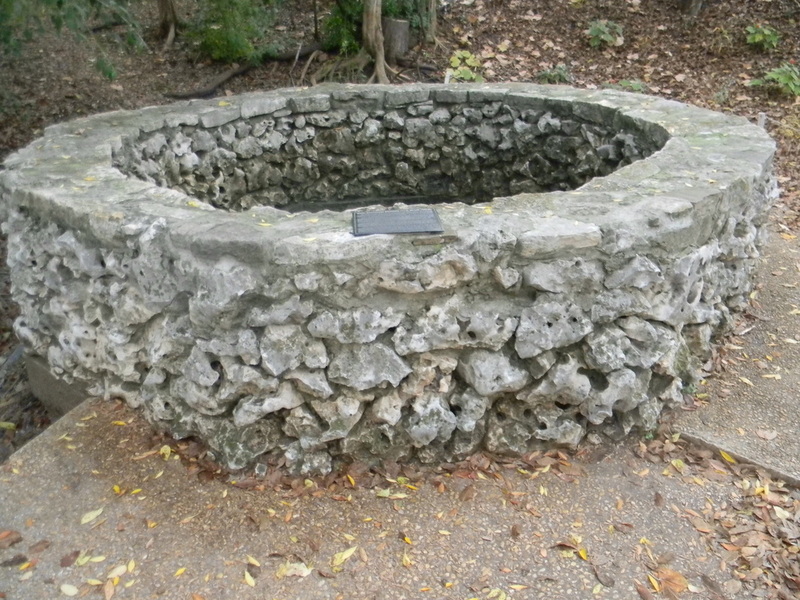 This area of the campus was once the source of San Antonio's first Water Works. The San Antonio River begins on the north part of the campus. Walking back towards the Brackenridge Mansion is the "Red Bridge" and "Lourdes Gortto". If you take the bridge over the San Antonio River you will head towards Incarnate Word's Athletic Complex. The "Cardinal Statue" sits in front of Benson Stadium which is the home of the Incarnate Word football and track & field team. In the center of the campus stands the clock tower. The tower sits on the Marjorie Jordan Carillon Plaza. Near the plaza are most of the academic buildings. At the edge of the campus is Incarnate Word Chapel which was built in 1907. In 2009 the chapel underwent a massive renovation. You will find several statues throughout the campus. 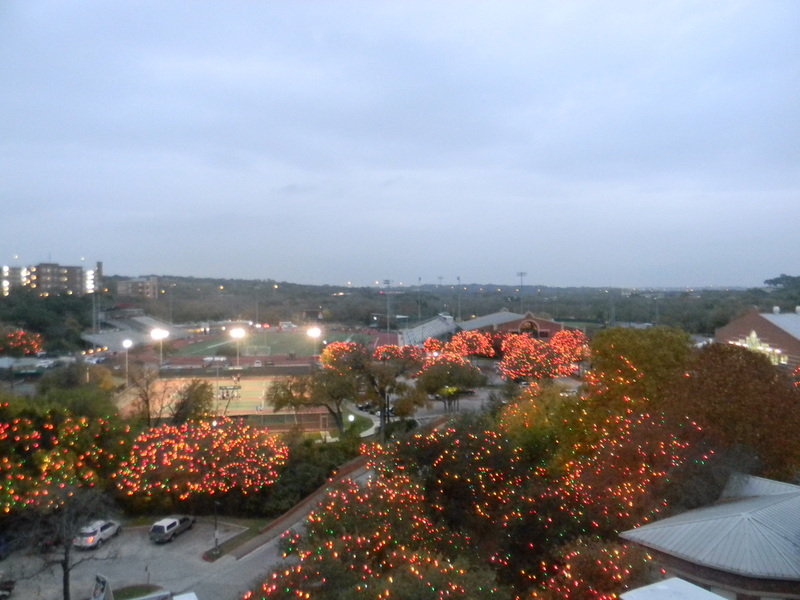 Incarnate Word around Christmas goes all out with their annual "Light the Way" ceremony. If you get a chance to visit the campus around this time I highly recommend it. Scoreboard: They have two scoreboards; the scoreboard on the west end of the building is the better of the two. A video board would be nice on the opposite sides of each scoreboard. 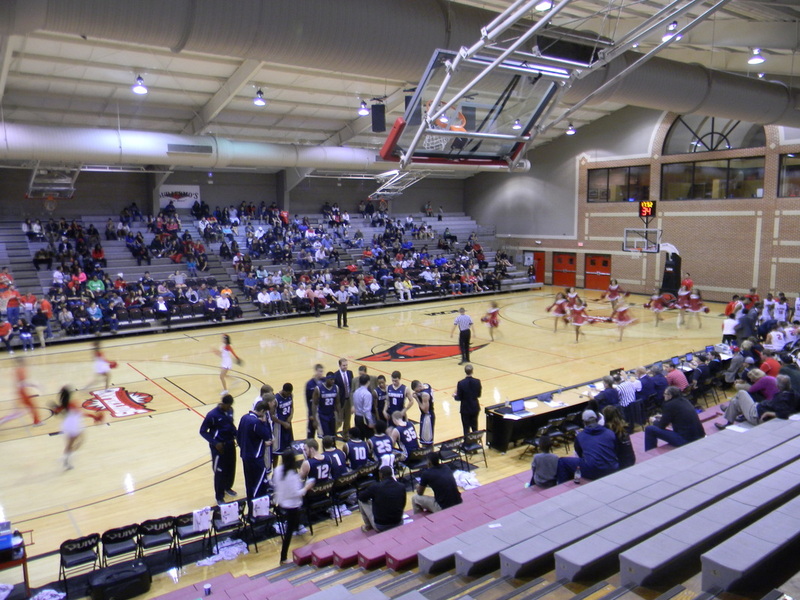 That being said, I don’t know how committed UIW is to keeping the facility as the home of the basketball team. Atmosphere: The crowd on hand was around 1,000. The band was solid all game playing some of the recent hits and classics. The student turnout was poor, it was hard to identify a true student section on my visit. San Antonio: (I used my AT&T center review, San Antonio write up) This is a great city to have a weekend getaway in. There are plenty of things to do in San Antonio from Sea World to the Alamo. If you're looking for an adventure Sea World, Six Flags or Schlitterbahn will keep you entertained. With only three Sea World's left in the US, this is the perfect time to visit. Take a ride on the Great White or check out over 100 penguins at the Penguins Encounter. Six Flags Fiesta Texas is located about 20 minutes from Downtown. The park has eight roller coaster. Schlitterbahn is about 40 minutes away from downtown and is consider one of the best water parks in the world by MSN Travel! The Riverwalk is the biggest tourist attraction in Texas and I see why. The Riverwalk's sidewalks navigate the city below street level and along the San Antonio River. One of the best ways to see the city of San Antonio and the Riverwalk is by taking a Rio San Antonio boat ride on the river. The river boat ride provides great facts about the city and river and is a relaxing way to see the city. If you get hungry you can choose from over 25 restaurants on the Riverwalk. From national favorites like the Hard Rock Cafe and Rain Forest Cafe to Riverwalk favorites Las Canarias and La Magaritas. If you're looking to get some shopping done on your trip, Rivercenter Mall should do the trick. The Riverwalk has plenty of lodging options, for visitors looking to stay right in the action. 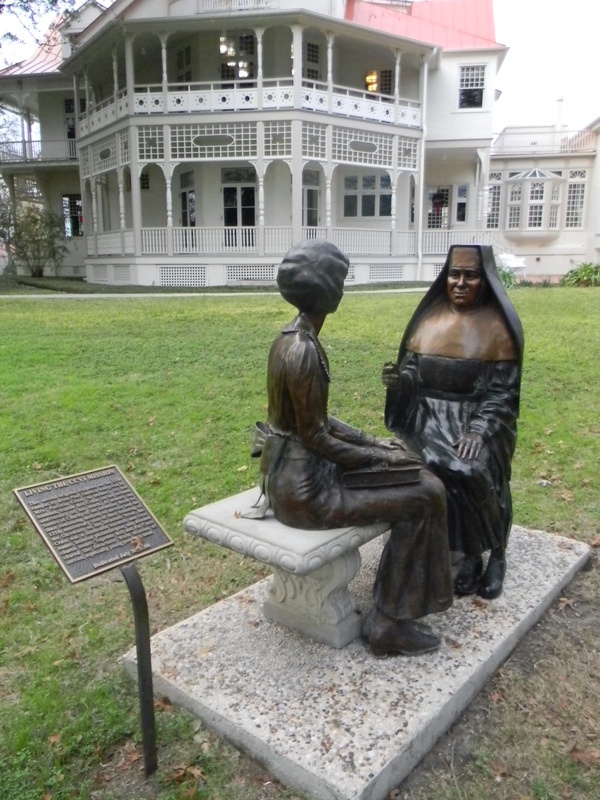 Statues in front of the Brackenridge Villa on the campus of Incarnate Word. 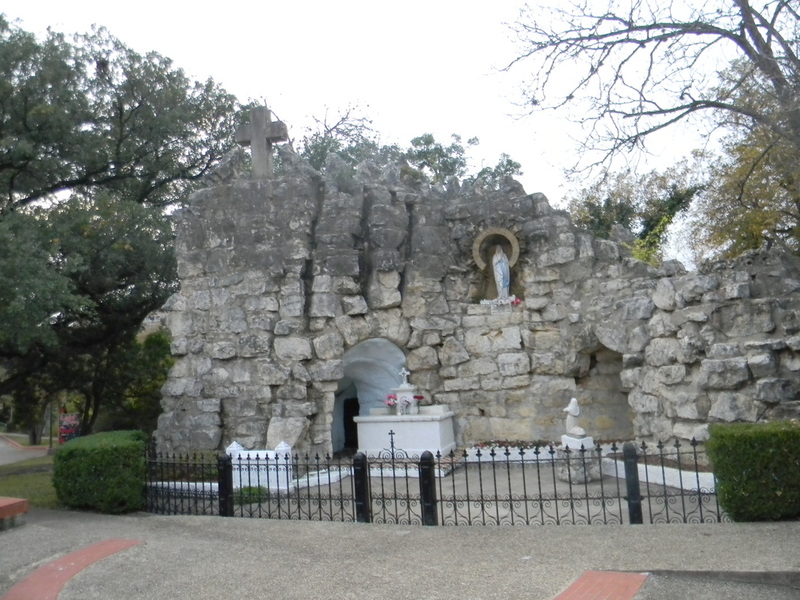 Lourdes Grotto on the campus of Incarnate Word. Check Out All Of Our Reviews Here!